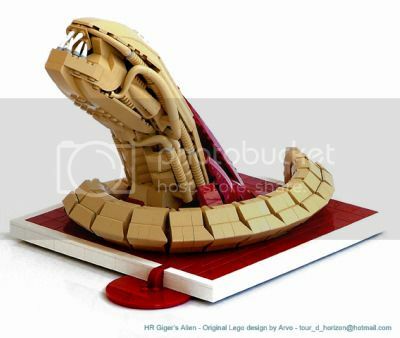 Arvo’s LEGO Alien chestburster model gets 87% of the way to Awesome all on its own, and then the pool of fake LEGO blood moves the needle to 100%. Plug the figures into your Abacuses of Awesome, and you’ll see that I’m right. Give or take a percentage point. Certainly it puts the chestbursted LEGO minifig to shame–at least in terms of artistic merit, if not grotesque hilarity–but the delightfully-depraved Alien chestburster baby shower cake still holds the title of Chestbursting WIN! in my book. P.S. That book is my diary. So quit trying to peek. See more photos in Arvo’s gallery on Brickshelf. Next post: Chuck Norris: JEDI MASTER!